Earlier this year, the anti-LGBT hate group Family Research Council joined forces with other Southern Poverty Law Center (SPLC) designated hate groups ACT For America, American Family Association (AFA), and Liberty Counsel to launch an ongoing attack campaign against the SPLC. Now it appears they're willing to enlist the authority of a notoriously anti-Semitic publication in their effort. 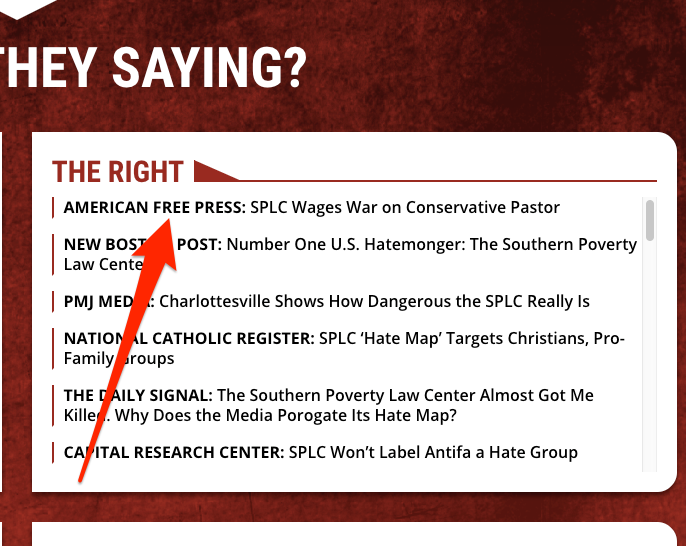 On the campaign site, SPLCexposed.com, the FRC and others have compiled articles criticizing the SPLC from right-wing publications like AFA's One News Now, Breitbart and the white nationalist friendly Daily Caller. Incredibly, they've added an article from the anti-Semitic weekly American Free Press (AFP) to their evidence against the SPLC. The Israelis literally control our press all except a few of us, the American Free Press and The Barnes Review and a few other patriotic, independent publications around the country. They control our Congress… . [A]ny one of them [members of Congress] is liable to rise up on the floor at anytime and deliver a speech praising Jews and Zionists and Blacks and Indians and heaven only knows, but can you imagine any one of them standing up and praising White Christians? As if that wasn't enough, the AFP article shared by the FRC and titled "SPLC Wages War on Conservative Pastor" is a feel-good interview with Chuck Baldwin, a fundamentalist preacher and antigovernment extremist who also happens to be a 9/11 truther. Like the AFP, Baldwin believes that "Zionists control America's television news networks, America's major newspapers, the Federal Reserve and most of America’s major banking interests." Family Research Council believes that homosexual conduct is harmful to the persons who engage in it and to society at large, and can never be affirmed. It is by definition unnatural...We oppose the vigorous efforts of homosexual activists to demand that homosexuality be accepted as equivalent to heterosexuality in law, in the media, and in schools. The FRC is listed as an anti-LGBT hate group for its demonizing rhetoric about the LGBT community including FRC President Tony Perkins' insistence that pedophilia “is a homosexual problem." This particular anti-LGBT slur has boomeranged back at Perkins after he prominently endorsed the Senate campaign of disgraced Alabama judge Roy Moore, who has been accused of sexually assaulting a 14-year-old girl when he was in his 30s. Perkins, who has said he has enjoyed "unprecedented" access to Trump's White House, has his own sordid political history. Early in his career, he escaped unscathed his connections to prominent white nationalists. A campaign he managed in 1996 was fined by the Federal Election Commission for covering up the purchase of a voter list from former Klansman David Duke. In 2002, Perkins spoke before a gathering of the Council of Conservative Citizens, a group that later radicalized racist mass murderer Dylann Roof. In their crusade against the SPLC, the circulation of a well-known anti-Semitic publication extolling an anti-LGBT extremist is just the mask slipping. Like Perkins, dig down into ACT For America or the American Family Association or Liberty Counsel’s record and you’ll find extremism well suited for pages of the American Free Press. In addition to the Family Research Council, sponsors of the #SPLCexposed campaign include hate groups ACT For America, American Family Association, and Liberty Counsel.